Unless you are fortunate enough to do your imaging in a very dry environment, you will be all too familiar with the problem of dew forming on your telescope objective, corrector plate or camera lens. As an astro-imager who spends all his time ten metres above sea-level and within sight of the North Sea, dew used to interrupt proceedings far too often for my liking. This post explains why dew forms and what we can do to delay or prevent it. So why does dew form on our equipment? The atmosphere contains water vapour, i.e. water which has evaporated and exists in a gaseous state. For a given atmospheric pressure and air temperature, the amount of water vapour in the air can be expressed in terms of Relative Humidity. When relative humidity reaches 100%, the air is fully saturated and water vapour will condense in to droplets of liquid water. This forms clouds higher in the atmosphere, fog near the ground or dew if it condenses on the surface of an object. As relative humidity depends on three factors (the amount of water vapour present in the air, atmospheric pressure and air temperature) a change in any one of these factors can cause dew to form. Of most concern to us as astro-imagers is air temperature which usually starts to fall after sunset. The falling air temperature may eventually reach the Dew Point, meaning that relative humidity is now 100% and so dew will start to form. On some nights the amount of water vapour and/or air pressure may mean that the temperature stays above the dew point all night, but at my temperate latitude I find that during the winter months the dew point often arrives before it is even dark. This is accurate to within +/- 1 degree C provided Rh is above 50%. Alternatively, you can buy a cheap TEMPerHUM USB sensor that plugs in to your PC. Many astro-imaging applications will automatically connect to these devices, calculate the dew point and warn you when it is approaching. I have to say that I haven’t found mine to be that accurate though. When you place your telescope outside, it loses heat to the environment in the form of infrared radiation. On a cloudy night, this Radiative Cooling is balanced out by incoming heat being radiated by the clouds. On a clear night though, outer space is radiating at about -270 degrees Celsius, causing a net loss of heat from exposed parts your equipment which rapidly cools them below the dew point. In the worst case, the surface may fall below freezing and the dew turns in to frost. The same thing happens to the windows on your car, which is why dew and frost form on them so readily. What can we do about dew? Do your imaging on a cloudy night. Dew will not form (unless conditions are right for fog), but the resulting images may be less than satisfactory! Wait for a breezy night. Dew is much less likely to form if the air is moving, since it does not spend enough time in contact with your equipment to cool below the dew point before it is replaced with warmer air. Of course too much wind can cause other problems with the stability of your equipment and guiding, but a gentle breeze is an effective means of preventing dew. Make a dew shield. I have constructed flexible dew shields from sections of foam mat cut to size. 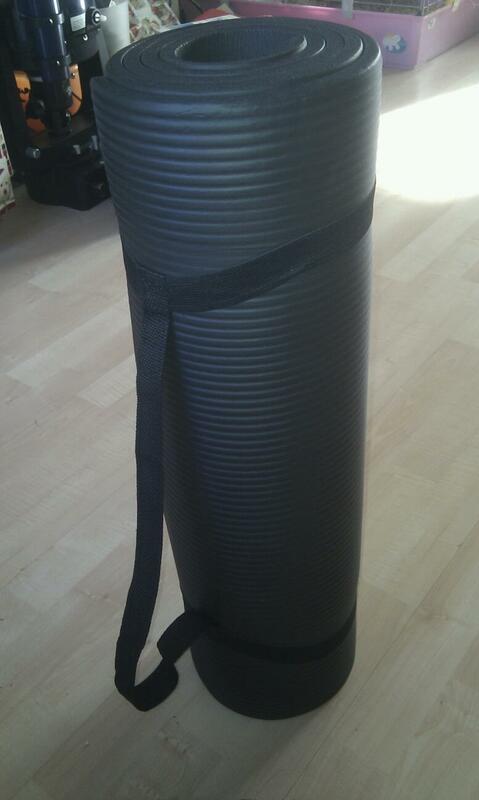 A cheap black camping mat or yoga mat bought from Amazon or eBay is the ideal material for the job. Cut a piece long enough to wrap around your scope tube with an overlap, and a bit more than 1.5 x the aperture of your scope wide. So for a 20cm scope it should be about 65cm x 35cm. Roll the mat in to a tube, check it will slide on and off the end of your scope easily (but grip and hold in place) and then fix in to shape with duct tape. With a dew shield in place, your objective lens or corrector plate only radiates heat away in to the portion of the sky that you are imaging, and in all other directions heat is radiated back from the dew shield. This delays the onset of dew formation, but does not always prevent it as eventually the dew shield cools to the point where it cannot radiate sufficient heat to keep the objective above the dew point. That is a why you shouldn’t spend a fortune on a proprietary metal dew shield. It may look more professional than a duct tape and foam monstrosity, but the thin metal cools to the point where it is ineffective much sooner than an insulated foam shield. Heat the optics to bring them back above the dew point. One method I have successfully employed is to borrow my long suffering wife’s hair-dryer. A quick blast on a dewed-up lens or corrector rapidly removes dew, but it isn’t the ideal solution. For one thing, if you overheat the front of your scope, you are at risk of creating local air currents for some time afterwards and thus causing distortions in your image. For another, it rapidly becomes a game of diminishing returns as the dew-free period tends to get shorter and shorter during the course of the night. If you have access to mains electricity, and your spouse is willing to lend you the required beauty appliance it can save the night at a pinch. Just be careful to use an RCD and do not leave the thing outside in the dew. This avoids the risk of electrocution and also the wrath of your other half. I’ll leave you to decide which is worse. Prevent your equipment from cooling below the dew point in the first place. This is the most useful strategy to keep your gear dew free throughout the night. The usual method is to heat any surfaces you wish to keep dew free with a Dew Heater Band. These are low voltage flexible bands that you wrap around the outside of your scope or lens to continuously heat them to just above the dew point throughout the night. Bear in mind that the aim is to keep the temperature of the surface just above the dew point, not to heat it to any appreciable degree (as that would cause unwanted air currents in front of or inside the equipment). A properly heated objective feels cold to the touch, but remains dew free all night. You can of course buy ready-made dew heater bands, but these are ridiculously expensive once you know how to make them. Prices range £20 for a small heater band up to £70 for a large one. In my next update I’ll explain how to make your own dew heater bands for a fraction of the cost of a ready-made commercial one.